When you ask someone what they enjoy doing for fun seldom will you hear them say “I love to learn about injury prevention and fixing the problem to an injury”. That is until you meet Jennifer Recinos. She knows firsthand the challenges and struggles of overcoming an injury. 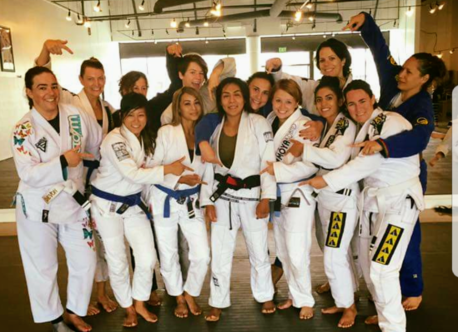 Recinos is a mom, navy wife, a caregiver, a personal trainer, a boxing instructor, and Brazilian Jiu Jitsu instructor. 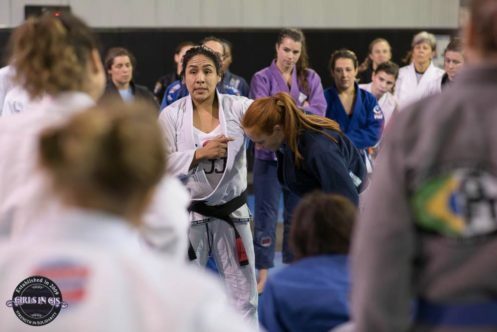 Having relocated to Ohio after spending most of her years training in Southern California Recinos has found her new BJJ home in various schools. Among them with Darren Barr. She says in all her years of training her biggest obstacle has been having knee surgery on her MCL, which is why she has become big on injury prevention. I have been training for 11 years in BJJ now. However, I initially started with boxing and Muay Thai to lose weight. Soon after I moved away from that due to an altercation with another student. (she was being somewhat of a bully). My brother at the time was training BJJ, and saw me crying, he suggested to try BJJ. The day after, I decided to take his advice. Fast forward to today, now I am hooked to this wonderful sport. What has been the most beneficial part of BJJ for you? The most beneficial part of BJJ for me has been getting me out of my comfort zone. I am a very shy and introverted person by nature. BJJ helps me get out of my comfort zone and have human interaction besides my family. Having​ ​to​ ​go​ ​through​ ​the​ ​process​ ​of​ ​hurting​ ​your​ ​knee, ​​surgery​ ​and​ ​rehab​ ​where​ ​you mentally​ ​and​ ​emotionally​ ​effected? ​ ​If​ ​so​ ​how​ ​and​ ​how​ ​did​ ​you​ ​cope​ ​with​ ​it? Yes, most definitely I was effected mentally and emotionally. Mentally, it made me stronger but at times I felt hopeless. Asking myself why me, and is all the pain worth it? Were some of the questions I was asking myself at times during the rehab phase. I coped with it because I wanted to beat the odds, I felt everything was against me. Family was my biggest support system through it all, and also the love of the sport. Have you ever wanted to quit BJJ? Yes, I have wanted to quit and have quit before. When I did, I felt something was missing and found myself unhappier. I am who I am today because I motivated myself to stay. I find joy in helping people learn about something I love. What​ ​do​ ​you​ ​do​ ​now​ ​to​ ​prevent​ ​injury? Incorporate knee stability workouts as often as I can. When I want to know something in regards to strengthening and proper form, I do extensive research. I also took initiative to educate myself by attending classes at NPTI San Diego. Furthermore, stretching is something that I do daily now, which has so many added benefits to give me longevity. prevention​ ​and​ ​fixing​ ​issues​ ​with​ ​injuries? It’s okay to take time off when my body is hurting instead of always pushing forward. It’s okay to take a break!